That was part of a conversation between me and a very politically aware young trans woman this week. Amongst my friends, and those who were involved at the time, the Tolietgate incident at Pride London, 2008, was a seriously big deal. It, and contemporaneous events shaped much of our activism and our relations with other bodies, such as Pride and Stonewall, in the years afterwards. 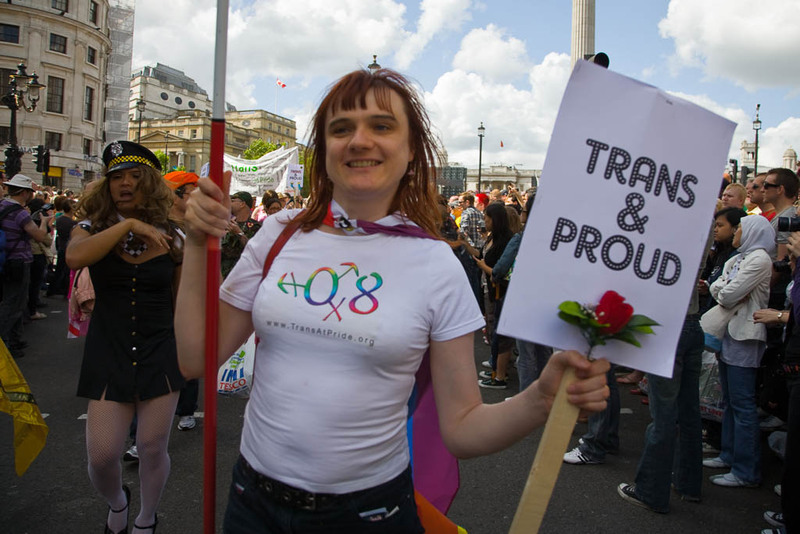 It was 2008; 6 years ago, and there are politically aware trans people in the UK now who do not know it happened. It hit me: much of our fledgling community’s history is oral transition, or scattered in old blog entries visited rarely by anything other than search engine robots. It is fragile, and yet it needs to be known, lest our community end up perpetually fighting wars of attrition by keeping old grievances on life-support, when all memory of what those grievances even were has slipped away, and when those whose grievances they actually were have moved on, or even passed on. I wrote a transition blog, starting in 2005, which was popular at the time (go look if you like, but be aware that language and ideas that we now regard as archaic and even transphobic were not so at the time – there’s been a lot of evolution since), but that was about me, and about how I was viewing events as they happened. With nearly a decade (in some cases) of hindsight, I think it’s perhaps time to look back and, with the benefit of that hindsight, revisit some things that happened, things that shaped our community, and write it down again. Only this time, it’ll be written as a witness looking back, rather than as someone reporting current events, the consequences of which had yet to play out. So keep an eye on this blog. I hope to get the first part up in a few days, and I don’t know how long I’ll stick at it, but we’ll see. This entry was posted in History by Sarah. Bookmark the permalink. While I think it’s true that our past needs to be remembered as it shows us how far we have come and thst we should never take were we are for granted. Sometimes it is good that younger trans people don’t take up the fights that have already happened and thst they take on there own fights and win them. You are right we do not need to rehash the same fights over and over and we need to move on. A lot of the young trans people I have talked to have a very different view from the one we had back in the day and it makes me so happy to know they don’t have to worry about a lot of the things that we did. I think in a lot of ways we find it hard to put down the gun and pick up the Plough and start growing instead of fighting. Out community is by its nature a transient one in some respects and sometimes we need to move on and let others lead there fight and support them in doing so because there fight is different from the one we started. Always fighting can see you fight to a standstill and never grow past it. I look forward to reading your reflections on the past and hope we do not carry them forward to the future. Utterly fair, fellow commenter whose name I can’t see; up until the point where history repeats itself and we don’t have a united collective sense of what worked last time. After all, in a way, Toiletgate was a rehashing of old battles about who has bathroom rights, and of sentiments that date back to the actual literal Nazis or further. To suggest such exclusion and bigotry while appropriating Pride and Stonewall from us is the kind of callous, casual evil we need to be prepared for at least as long as it’s evidently not going away. One thing I like about the idea of an archive is not being *forced* to be largely disconnected from our history. Other groups of people, all of whom will have trans/2S/etc members, have a largely shared sense of the indignities they’ve suffered, of what’s offensively disrespectful toward their history and what strategies have worked and failed at achieving the goal of the moment – even if there are some quibbles about the canon , the knowledge is at least quickly available for some to study. personally I have gotten a great deal out of the histories compiled by and for Jewish people, look forward to this and feel more anxious about not having the info than being reminded of past struggles. others will have different needs but ppl tend to choose their own level of involvement in reading and disseminating history.